I'm in a somewhat unusual career. I know that I've developed and become a better photographer as my experience has grown, but it's hard to... Prove it? Every wedding is different, every venue is different, so it's hard to look at old photos and new photos and know what change is me, and what change is circumstantial. Which is why I love the events I photograph for UConn every spring. Not only are they often in the same venue year after year, but quite often the same people speak, wearing the same regalia. It's a rare chance to compare apples to apples. I especially wanted to compare this year because I made a substantial change, switching from ambient light/bounce flash to using a remotely-triggered flash on a stand. It's not a huge change, but I feel like it makes a real difference. Just a little something I thought was interesting! Next week more adorable couples, or possibly a baby. I've previously talked about my friends Skoobah and Nate when I did their unique engagement shoot for them last fall. 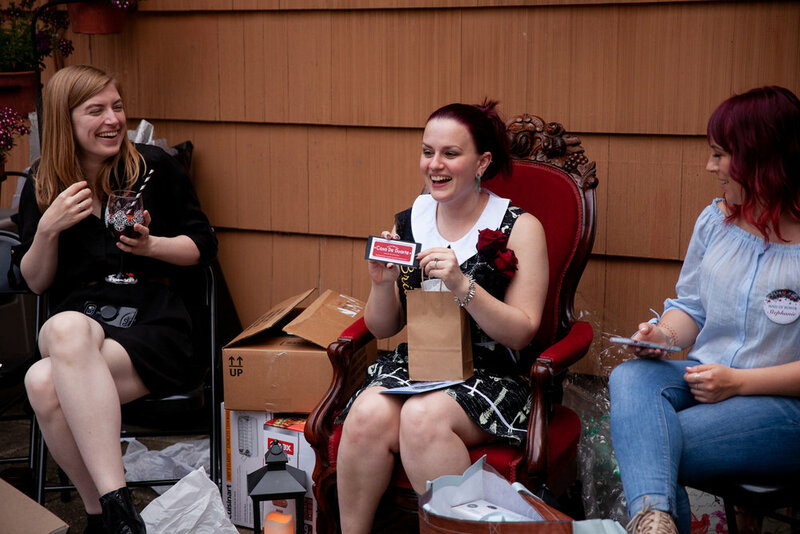 I was super excited when Skoobah's mom, Judy, asked if I would photograph her bridal shower as a surprise. I even managed to catch the moment Skoobah realized who was standing behind the big camera lens. I was also really excited to see that Judy totally bought in to her daughter's preferences where it comes to theme. There was no shortage of skulls, candles, and other gothy, steampunky details. Also: no shortage of amazing, homemade desserts. I got to take home a doggy bag of treats which, for the record, is a very good way to tip me. After a lovely dinner, Skoobah opened her gifts while her guests played bridal shower bingo. A couple of her bridesmaids did something very cool that was new to me - using pieces of wrapping from the gifts, they made her a bouquet. Very cool. Finally, Skoobah and her bridesmaids goofed off in front of the very impressive homemade photo booth backdrop. Odds are good this backdrop will be back for the wedding day. Just a couple of months to the wedding! Can't wait, because I know it's going to be something really special. Here's a quick one: Mauresa had me come out for her daughter's first birthday party. It was amazing - tasty treats, a ball pit, cake smashing, and Minnie Mouse! It was a fun time, and I got to take home a cupcake, which is always a good thing. I joined Colleen and Mandeep on a balmy but beautiful night at Mystic Seaport for their rehearsal dinner. Even so, it was a beautiful night, and Colleen and Mandeep's family and friends were so gracious and friendly. Even though I was leaving that night to go on a vacation to Cape Cod, I really wished that I could stick around to see the happy couple on their wedding day. 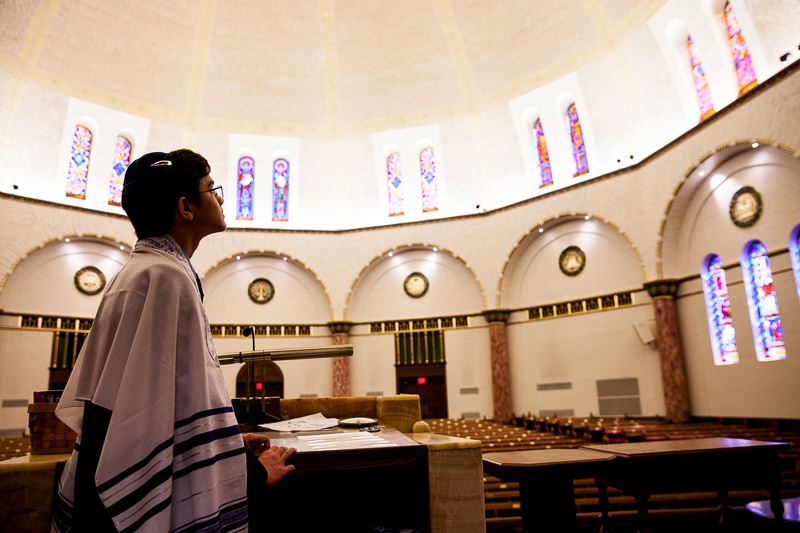 This Saturday I got to hang out with Andrew and his family and friends for his Bar Mitzvah. We had such a good time! The ceremony took place at Congregation Beth Israel, which has to be one of the most beautiful venues I've ever worked in. Just stunning. ...and the traditional Bar Mitzvah celebrations. I had so much fun and, as with my first Bat Mitzvah last fall, I was so impressed by Andrew's maturity and by the whole celebration. Then, as a perfect little cap to the night, I stepped outside to take a breath... And looked up to see this view. This time of year, I cover a handful of events for my alma mater, UConn, specifically the School of Business. Unlike most of my work, I can't share that many photos from the events, but I always make sure to get a few more artistic photos. The first was the UConn Risk Management Conference in Stamford. The second was the EMBA graduation, at the beautiful Society Room in Hartford. I love any excuse to work in this gorgeous old building. It's also a lot of fun, because I have been working with the EMBA program long enough that I took headshots for these graduates back when they showed up for the first day of class two years ago. Is it weird to say I enjoy watching them grow up when they're all older than me? Maybe, but it's still fun. March is ending in it's typical yearly lull. No complaints, it gave my fiance and I a chance to get out of town for a few days. We visited some friends, Brooklyn Bridge Park, and we spent a day at the Museum of Natural History. April is shaping up to be busy, though! Mostly events for UConn plus a Bar Mitzvah and possibly a last-minute trip. It was while preparing for one of the UConn events that I had a strange feeling of deja vu. The photos on the event page seemed familiar... because they're mine from last year's event! Always a pleasure to see my work getting used. This Saturday I had the pleasure of photographing my first bat mitzvah. I got incredibly lucky - not only is she a beautiful, confident young woman, but her family was extremely helpful in guiding me through everything. It was a beautiful ceremony. There was an unusual treat: No cameras allowed during the real deal, so I got to photograph the rehearsal (which I was free to interrupt, pause, and pose), and then to actually sit and enjoy the real ceremony. I love that there is an emphasis placed not only on spiritual growth, but also on working to improve this world in concrete, practical ways. Following the ceremony was a reception with great food, great music (a live klezmer band! ), and an opportunity to take a photo that I suspect every event photographer looks forward to taking at some point. It was a great time, and it's something I hope I can do more of in the future.